The Income Tax Department has made it easy for taxpayers to link their PAN with Aadhaar. Just click on the link on the left pane-> Link Aadhaar. Provide PAN, Aadhaar no. and ENTER NAME EXACTLY AS GIVEN IN AADHAAR CARD (avoid spelling mistakes) and submit. After verification from UIDAI, the linking will be confirmed. In case of any minor mismatch in Aadhaar name provided, Aadhaar OTP will be required. Please ensure that the date of birth and gender in PAN and Aadhaar are exactly same. There is no need to login or be registered on E-filing website. This facility can be used by anyone to link their Aadhaar with PAN. 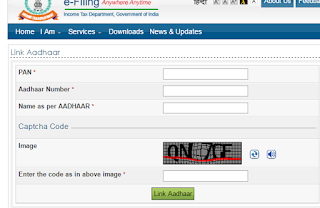 2- Click on link Link Aadhaar on left as per picture. 4- After filling the above, you have done. A page will be opened saying Aadhaar-PAN linking is comleted successfully. - Ensure the Date of birth, Gender and Aadhaar number is as per aadhaar details to proceed futher. - If Date of birth and Gender is fully matched and name as per aadhaar in not exactly matched then the user has to additionally provide Aadhaar OPT(One Time Password) to proceed with partial name match.